Hans Holbein the Younger was unquestionably one of the best portrait artists of the German Renaissance, and - along with such artists as Albrecht Durer (1471-1528) - helped to enrich late German Gothic art (exemplified by the work of Matthias Grunewald) with the more progressive features of the Florentine Renaissance (c.1400-1500). During his early period in Basel (c.1515-26) he produced numerous types of art, ranging from large-format mythological painting and Protestant Reformation art to woodcuts and miniature painting. But it is the portraiture created during his time in England (1526-28 and 1532-43), for which he is most famous. He was an absolute master of drawing, and his portraits were admired by contemporaries for their true-to-life character. In fact, it is largely because of Holbein's pictures that we have a visual record of the celebrities of his day, including Desiderius Erasmus of Rotterdam (1469-1536), Sir Thomas More (1478-1535), Thomas Cromwell (1485-1540) and of course King Henry VIII (reigned 1509-47). Furthermore, to the endless amusement of scholars and art historians, Holbein enhanced his portraiture with numerous symbols, allusions and ironic motifs. The Ambassadors was painted during Holbein's second stay in England (1532-43), which coincided with Henry VIII's break with Rome - over his decision to anull his marriage with Catherine of Aragon - and the formation of the English Protestant Church. As well as being painter to the king, Holbein also portrayed numerous noblemen and women, clergymen, landowners, and statesmen. A hundred years later, the equally short-lived Flemish virtuoso Anthony van Dyck (1599-1641) would repeat Holbein's example and settle in England as court painter to Charles I (1600-49). 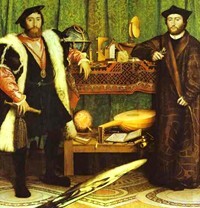 One of the greatest portrait paintings painted by Holbein during his second visit to England, was The Ambassadors, a life-sized double-portrait of the wealthy landowner Jean de Dinteville (150455), ambassador of the King of France, and his friend Georges de Selve, Bishop of Lavaur (150841). The work is suffused with hidden meanings and symbolic features, in the best tradition of the Northern Renaissance, and the later Vanitas painting of the 17th century. The work was commissioned by Jean de Dinteville, the young ambassador, to commemorate the visit to London of his friend de Selve - who, incidentally, is not wearing episcopal robes because he was not actually consecrated until the following year. The two men were on a tricky and ultimately unsuccessful diplomatic mission to heal the rift between Henry VIII and the Church of Rome, hence its (plural) name, "The Ambassadors". It may be, therefore, that the main theme of the painting - namely, that no amount of material wealth, power or learning can prevent death - was Holbein's (meaning, Thomas Cromwell's) way of saying that no man, including the pope, had any real power to halt what was inevitable. In this case, the 'inevitable' was Henry's decision to create his own Church. As well as being a portrait, The Ambassadors is also a still life painting featuring numerous meticulously rendered objects. Of course many sixteenth century portraits of learned men contain objects that reflect their occupations and interests, but Holbein's picture is particularly impressive owing to its extraordinary attention to detail, and the sheer amount of information it contains. It shows quite clearly that, as well as Gothic and Renaissance art, Holbein was also strongly influenced by the meticulous realism of early Flemish painting, exemplified by Jan van Eyck and Robert Campin (1375-1444), the Master of Flemalle. The depiction of the two figures is both technically brilliant and symbolic. De Dinteville, on the left, is dressed in luxurious secular clothes - a meticulously rendered heavy black coat lined with lynx-fur, over a pink silk tunic. On his hat is the image of a skull - his personal insignia - which is undoubtedly a memento mori. The bishop and classical scholar Georges de Selve is dressed in less ostentatious clerical clothes. Significantly, his stance is less assertive than that of his colleague, and he actually occupies less space in the picture frame. Some experts also point to de Dinteville's secular roots and de Selve's clerical roots as symbolizing the dysfunctional nature of the alliance between France and the Vatican, as well as the general conflict between Church (pope) and State (Henry VIII). In addition, the image of the lute with a broken string (lower shelf) is a popular symbol of discord, either reinforcing the idea of a conflict between England and Rome, or alluding to the Continental schism between Protestants and Catholics. The setting for the portrait is an area of relatively shallow depth, curtained off by green-coloured drapes decorated with complex, heraldic-style patternwork. The floor is covered with mosaic tiles, based on the design of the 'Cosmati pavement' in front of the High Altar in Westminster Abbey, suggesting the paramount nature of the English liturgy. Laid out on the two shelves standing between the two figures are numerous other objects with which they and their era are associated. Featuring a mixture of navigational, astrological, and musical instruments, they include two globes (one celestial, one terrestrial), a quadrant, a torquetum, a polyhedral sundial, a T-square, a German maths book and a Lutheran hymn book. On the surface, the painting seems to be a glorification of man's achievements, until one becomes aware of the meaning of the blurred diagonal-shaped image hovering just above the floor. Holbein has deliberately distorted the image so that its meaning only becomes evident when it is viewed from high up on the right side, or low down on the left side. When seen from these angles, this anamorphic image is immediately recognizable as a human skull - the age-old reminder of death and the fundamentally transitory nature of human values. Why Holbein gave it such prominence is unclear. It has been suggested that the painting was intended to hang in a stairwell, so that anyone ascending the stairs and passing the painting on their left would be shocked by the sudden appearance of the skull. Although The Ambassadors is a clear reminder of human mortality - a state which overrides all earthly matters - it is not a pessimistic picture. Because, tucked away in the top-left corner is a crucifix - a clear symbol that faith in Jesus Christ helps us to escape death and secure everlasting salvation. Note: Other portraits completed by Holbein during this time, include those of: Robert Cheseman (1533, Mauritshuis, The Hague); William Reskimer (1534, Royal Collection); Sir Brian Tuke (1535, National Gallery of Art, Washington DC), Charles de Solier, Sieur de Morette (1535, Gemaldegalerie Alte Meister Dresden) and Derich Berck (1536, Metropolitan Museum of Art, New York).  For more outstanding Northern Renaissance portraits, see: Homepage.